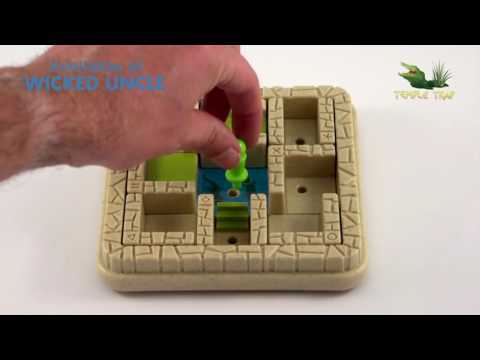 Challenging logic game moving sliding puzzle pieces to help the adventurer escape the deadly temple. Put your problem solving skills to the test as you move up through the 5 different levels of difficulty from Starter to Wizard. The aim of the game is to help the adventurer escape the terrifying temple by sliding the walls to create a safe path, avoiding the snappy crocodiles and the constant shifting walls - not as simple as it may sound! The 14"x14" game board is the perfect size for travel and with 60 different challenges this strangely addictive game will have you hooked for hours. Can you release your inner Indiana Jones and conquer the deadly temple? Box Size: 9.5" x 7" x 2"
Jungle Hide & Seek - Spot the Creatures! Single player logic game with 80 different thicketed challenges!